Here is another business novel I came across last week, downloaded to my Kindle and just finished reading: The Boss, by Andrew O'Keeffe. I've read a good number of business novels and business parables in the last couple of years. This is the best to date, and probably the first I wouldn't mind reading again, and again. In fact, I might put a reminder on my agenda to read it every year a week or so before my employee appraisal meeting. And if I find myself in a job interview, I'd want to read it again as part of my prep work. The story is written from the point of view of an employee facing a great cast of horrendous executives and according to the author, based on true stories. I find it hard to believe a company run by these executives would survive long but for the purpose of storytelling, it works. * get to the point (the learning point), move on. * a quick description of the setting, to the extent that it relates to the core of the story, is good, but there's no need to overdo it with beautiful prose. Simple prose, relatively short sentences, common vocabulary. It's meant to be read by busy business people, not for a day at the beach. * keep it simple: No need for subplots or an extended cast of characters. Stick to what's needed to tell the story and not more. This particular novel makes good use of Aesop's fables (an early form of didactic fiction), connecting individual fables to situations the main character is encountering at work. 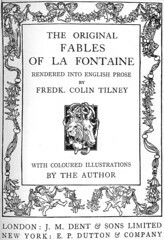 I grew up with the Fables of La Fontaine rather than Aesop's fables but it's the same idea. The story starts with a good amount of whining about how bad bosses can be, but slowly, the main character learns to handle her reactions to the three "Bs" (bad boss behavior) and how to not be a victim. The cases of bad boss behavior she confronts are a little exaggerated. They may all be based on true story but I would hope no one would be so unlucky to be exposed to all of them at once in one job. I wrote in an earlier post about the role of the advisor in the business novel. This business novel doesn't have an advisor. There are a couple of people around the main character who provide useful insights and encouragement, but no single individual has all the answers. That worked very well in the story and it's much more realistic than the "all-knowing" advisor. There are many parallels between this business novel and what I am trying to write in Learning Log. At the end of the book, there are discussions questions for facilitation, and sections meant for specific audiences (employees, leaders, etc...), something I've also tried to incorporate in Learning Log. In many ways, it's telling me that I'm on the right track and I have more work to do to make my novel as good as The Boss. PS: I've also found 3-4 other business novels and discovered that Japanese business novels are quite popular. I wonder if the French have written any.